"From 1985 to 1986 he was head of the students' council representing the Muslim Brotherhood" whose charter is to destroy Israel. In 2007 Fatah was the leader in Gaza, but Hamas was created in the 1st Intifada of 1987 and eventually kicked Fatah (Palestinian National Liberation Movement) created in 1959, out of Gaza. The elections of 2006 did it. Somehow, the people of Gaza had decided they wanted a terrorist group to be their government. Hamas could have had a hand in fixing the elections, just like Syria's elections yesterday showed that Assad won again. 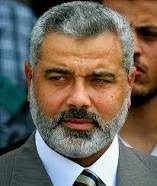 *Haniyeh was dismissed on 14 June 2007 by Abbas, who appointed Salam Fayyad instead." Abbas had no real power so Fatah then retreated to Ramallah in Judea and Samaria. Mahmoud Abbas, 79 years old, who's been president since November 11, 2004 in Ramallah, remains president in this new merger of Fatah, formerly the PLO and Hamas, a terrorist organization. At first he was called the chairman but the next year was titled as president. That's a good 10 year run of hoping for such notoriety. They've tried to unite in the past but it didn't last long. Abbas, out of the PLO, will also have his current PA prime minister who will lead the government cabinet. Both groups have a list of ministers to run their government already. Hamas's military wing will stay as it is after some upcoming promised elections due about 6 months from now. Their new cabinet leader is the current Prime Minister Rami al-Hamdallah. He's a former university president. He'll also be the interior minister. Abbas will be the decision maker on diplomacy and policy about Israel. Hamas Terrorists: Military wing ", theIzz ad-Din al-Qassam Brigades, in the Palestinian territories. Haniyeh thinks that now they will be empowered to fight Israel. This was said at a rally on Tuesday, May 27th in Rafah.. Those fighting words sound like good reason to reject them as a new state. Palestinian reconciliation aims to unite the Palestinian people against the prime enemy, the Zionist enemy. It aims to pursue the choice of resistance and steadfastness." JP. The problem now lies with the fact that Hamas will be able to get to Fatah's Western-equipped security forces in Judea-Samaria. They only were given such arms because they were not busy attacking Israel. Now they've joined with the terrorists who haven't stopped attacking since this is their whole purpose of being. .
Israel objects to this new reconciliation because Hamas is the group constantly bombarding southern Israel with rockets, mortars and missiles. They are terrorists. They can't okay a state that refuses to recognize Israel though they have been a state for the past 66 years and instead is attacking them. So far their economic survival has depended on foreign donor countries. They have no money in the coffers because of bad management and couldn't even pay their electric bill to Israel. One remembers that Arafat, leader of the PLO, was very rich. His wife, who lived in France, inherited a lot of his wealth. "Arafat's commodity monopolies could accurately be seen as gouging his own people, "especially in Gaza which is poorer, which is something that is totally unacceptable and immoral." Fayyad claims that Arafat used $20 million from public funds to pay the leadership of the PNA security forces (the Preventive Security Service) alone. US Secretary of State Kerry says US will work with Palestinian unity government. My question is still, "How do you work with them if their goal is to destroy Israel? By united Hamas with Fatah, it shows that Hamas will get their way and that Abbas has given into them just to get his state.